Dorothy's tornado was nothing compared to the giant swirlsof plasma that storm in outer space. Space tornadoes are funnels of hot charged particles aroundthe Earth that flow at more than a million mph (1.6 million kph). 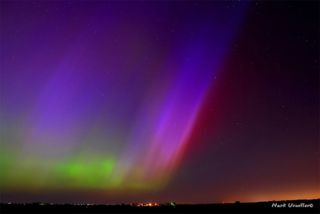 As the ionscircle, they produce strong electrical currents that help create the gorgeous light show known as theaurora. New observations of these cosmicstorms by a suite of NASA spacecraftcalled THEMIS (Time History of Events and Macroscale Interactions duringSubstorms) help shed light on their inner workings. THEMIS found that spacetornadoes can produce electrical currents greater than 100,000 amperes (forcomparison, a 60-watt light bulb draws about half an ampere). The tornadoes then channel this current of flowing electriccharge along twisted magnetic field lines into Earth's ionosphere to sparkbright and colorful auroras. Andreas Keiling, a space physicist at the University ofCalifornia, Berkeley's Space Sciences Laboratory, presented THEMIS's findingstoday at the general assembly of the European Geosciences Union in Vienna,Austria. The five space probes that make up THEMIS lifted off inFebruary 2007 ona mission to study the origin of magnetic storms that power the aurora(also known as the Northern and Southern Lights). THEMIS measured the tornadoes while traveling through themat about 40,000 miles above Earth. Ground telescopes watched simultaneously toconfirm the observations. The intense currents don't pose any threat to humans, theresearchers said. But on the ground they can damage man-made communication devices,such as power transformers. A better understanding of all this is needed to improvespace storm forecasting and to predict what might happen to power grids.Experts say the next period of maximum solar activity ? duearound 2012 ? could bring a level of storminess not seen in many decades. A recent report by the National Academy of Sciencesconcluded that a major storm during the next peak couldcripple power grids and other communications systems, with effects leadingto a potential loss of governmental control of the situation. Other members of the team include Karl-Heinz Glassmeier ofthe Institute for Geophysics and Extraterrestrial Physics (IGEP, TU) inBraunschweig, Germany, and Olaf Amm of the Finnish Meteorological Institute.